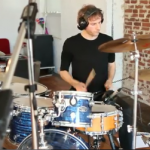 Last week Ferran Esquerdo stepped into the big live room to record some amazing drum beats for his demo reel. We found the sweet spot in the room for his drum tones and got to work laying down some great tracks. This is a good chance to hear how awesome drums on their own sound in the large room, using every bit of the room’s natural effects to advantage. Check out Ferran Esquerdo’s work by watching the videos below. For the best sound plug in your favorite pair of headphones, sit back, and enjoy. Also, if you like what you hear, comment below & let us (& Ferran) know! Posted in Artists, Ferran Esquerdo, Video and tagged beats, Brooklyn, brooklyn recording studio, drummer, drums, hip-hop, large room, Metrosonic, Metrosonic Recording, Metrosonic Recording Studio, recording studio brooklyn.